We’ve now almost finished on site having completed all the electrics, which includes fire alarms, burglar alarms, internet networking and a hearing loop..all the usual things for a public building. Everything is now plasterboarded out and painted and we have installed all heating & lighting and MVHR systems and ducting, though the MVHR system has not been fully commissioned yet. The MVHR system at Stirley Farm needs to have the capacity to cope with huge contrasts in occupation levels. At various times there could be anything from 20-30 kids all cooking on Baby Bellings or a packed audience watching a film, to occupancy by only 1 or 2 YWT staff. The building will also have long periods of unoccupancy – eg over weekends etc. To help the building cope with these contrasts we have decided to install two MVHR systems – (both PAUL Novus 450 units). Both will be running continually at a base level fan speed (fan speed 1) for 365 days a year. Unit 1 is solely for the main hall. Unit 2, supplies the meeting room but also provides air to the reception area and the main hall using the ‘cascade principle’. In this case as the entire building extract is taken out of the kitchen end of the main hall, the air that is supplied into the meeting room will pass through the reception area, and also through the store room floor grille, before traveling the length of the hall to be extracted. Both systems have CO2 and humidity sensors that will trigger them into ‘boost mode’, (fan speed 3) until the sensors detect sufficient reduction. The CO2 sensors are set so Unit 1 will trigger at 1400ppm and Unit 2 at 1600ppm. The main hall will be used for various different activities, including cooking (with potentially high humidity levels), and a wide range of occupancy. At rest/ when the building is unoccupied Unit 1 will run at fan speed 1. When the hall is used then the staff will turn the ventilation rate of Unit 1 up to fan speed 2. If either the relative humidity goes above 80% or the CO2 above 1400 ppm then Unit 1 will automatically be triggered into boost (fan speed 3) by the sensors. If the staff forget to activate fan speed 2, then the sensors would still activate boost ventilation level. If the ventilation rate is not sufficient and the CO2 levels rise to above 1600 ppm then Unit 2 in the meeting room will be activated into boost mode as well supplying cascade air to the hall. This will give a maximum ventilation rate of 900m3/hr. The meeting room upstairs is only for occasional use, but when used can potentially have a large number of people in a small space. At rest/ when the room is unoccupied Unit 2 will run at fan speed 1. When the meeting room is being used for a normal occupancy of 8-12 people then fan speed 2 should be used. If the room has a greater number of occupants or is occupied for longer than an hour then fan speed 3 should be used. There are no sensors in the meeting room. Though the description above may sound complicated, for the building users it really very simple. They should turn the ventilation to fan speed 2 when in use and if they do nothing main hall will self ventilate. The meeting room will have a small information notice for users saying “Please switch to fans speed 2 when in use. If more than 12 occupants then switch to fan speed 3. Please remember to return to automatic when leaving the room”. This information notice will have the control panel icons embedded in the text for clarity. The PAUL MVHR control system has a very nice clear touch screen display with clear icons. It also has a 7 day programmer which allows all 4 ventilation levels (includes off) to be programmed in 15min intervals. If there is a regular pattern of building use then it would be useful to use the program facility to automate the ventilation levels. We are very lucky in that there is mains gas on site, which was installed for the former farm house. 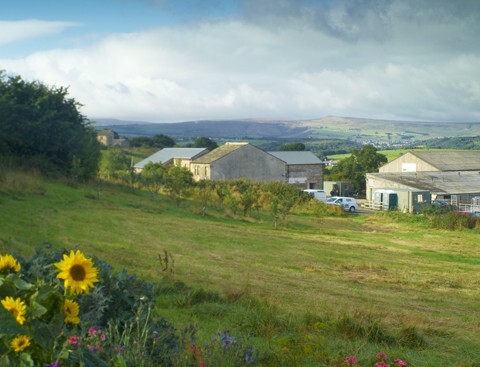 We have persuaded our clients the Yorkshire Wildlife Trust that it is better to use the mains gas in a very minimal way than invest in a costly biomass system, as was originally put forward, particularly as the capital costs of putting in a very small domestic-sized gas central heating system will be much less. With regard to heating strategies at Stirley Farm, we have benefited greatly from the lessons learnt from our experiences at Denby Dale Passivhaus. In its first year of occupation owners Geoff & Kate Tunstall sometimes struggled to control the temperature in the house and had problems with their gas boiler ‘cycling’ due to insufficient water volume in the system, due to the small number of radiators in the house. We decided to go for a simple gas heating system – a Vaillant condensing combination boiler with 5 radiators (1 in the meeting room, 1 in the lobby and 3 in the main hall). Of course, a combination boiler does two things – the space heating and the hot water. At the Cre8 barn we felt that there would potentially be a need for a lot of hot water at once, because there is a row of sinks in the barn for children to wash their hands after gardening/ before cooking etc. So we felt we needed to go for the biggest Vaillant boiler that we could find – at 12.9 kW output (the boiler we used at DD had 4.7 kW output). However, we only need something like 2.2 KW to heat the barn when it is -10 degrees Celsius outside (the equivalent output of a 2 bar electric heater). So, we are putting in a boiler and quantity of radiators with far greater output than is necessary. Having that volume of water and large number of radiators means that the boiler won’t ‘cycle’ and there will be a lower ‘return temperature’ which will make the boiler work at optimal efficiency. We’re also going to have a very simple control system with just a room temperature thermostat, which will be on constant 19 degrees Celsius. The radiators themselves won’t have any thermostatic valves or any of the usual controls. So it will fire up and heat the building very quickly – as we’ve got over-sized capacity – and will then turn itself off when the building has reached 19 degrees. The over capacity with the heating system also gives extra insurance for us as designers. It’s not a building that will have continuous occupancy and activity – it will have down periods when noone is in there, so you’re going to need that capability of heating the place up quickly. An additional advantage of using such a simple heating system is that every plumber in Huddersfield will know how to maintain and fix it if it breaks down. For maintenance purposes, it’s the easiest option. So for a very low energy Passivhaus retrofit project, the Cre8 barn will have rather a lot of radiators..but they will barely be on at all! In keeping with our low energy goal at Stirley Farm, we have gone for LED lighting throughout the barn, supplied by LEDHUT (www.ledhut.co.uk). I hadn’t realised what advances have been made with LED lighting in terms of light quality and softness of lighting (we went for ‘warm white’ bulbs in most instances). We wanted a lot of floodlights in the barn, to help illuminate the ceiling trusses and ductwork, which were all available with LED bulbs, as were downlights and illuminated exit signs. LED lighting can use up to 90% less electricity than a standard light bulb so matches well with Passivhaus levels of space heating savings. Although there is an initial extra outlay buying LED lighting, the bulbs can last up to 17 years without replacement and pay for themselves very early on in terms of energy savings. We are currently doing all the paperwork necessary for EnerPHit certification and are working with Pete Warm from WARM low energy practice towards this. In our next and final blogs we’ll share final certification and airtightness results on the project.